Lake Tahoe Concours d’ Elegance Wooden Boat Show is coming to North Lake Tahoe August 9–10, 2013. 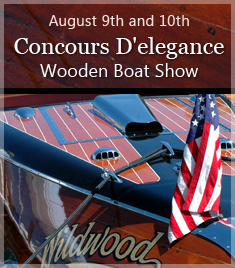 Visit this much celebrated event — the Concours d’ Elegance Wooden Boat Show! This 41st annual event takes place along the docks at the Sierra Boat Company in Carnelian Bay, Lake Tahoe. It attracts 6,000+ visitors each year and showcases about 100 antique wooden boats. The event includes competitions and great classes that teach the most up-to-date wood craftsmanship standards, finish work and detailing on classic watercraft. Sponsored by the Tahoe Yacht Club Foundation, this event is one of the most highly acclaimed wooden boat celebrations in the United States. For tickets and more information, visit the Concours d’ Elegance website. For other great Lake Tahoe events, see our Lake Tahoe events calendar.